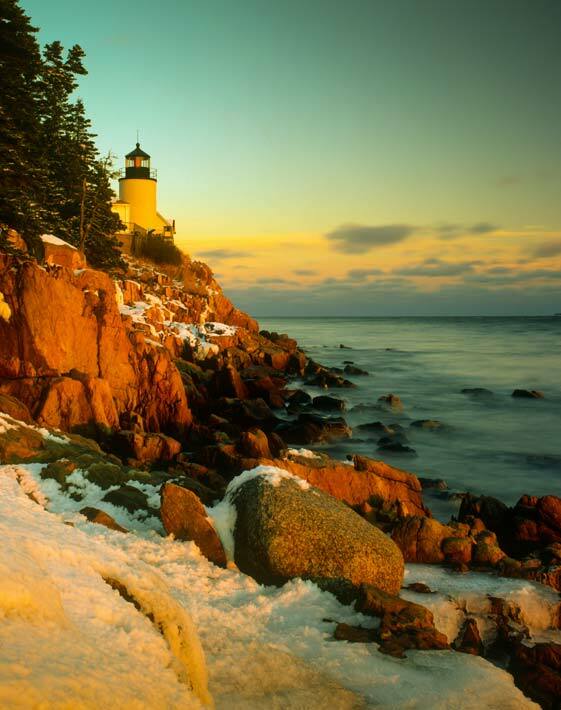 Winter in Bar Harbor - a vacationer's guide for things to do. What’s Winter in Bar Harbor like? This is one of the most frequently asked questions—and it’s the hardest to answer. For one thing, we have spectacular views of the mountains—every day. We may have the most spectacular surf during winter storms; we may have snow—during the last two winters, we’ve had a lot of snow, but we are usually surprised by it. It often snows for a few inches and then turns to rain and then freezes. Ice is the result and we do have a lot of ice. The ocean moderates our winter climate just like it moderates the summer climate and moderates the fall – giving us long, relatively warm falls. It is dark early in the winter. We are the first place to get the sun in the United States in the morning (4:30 AM in May) and the first place to get dark in the winter (4:30 PM in December. “When the days begin to lengthen, the cold begins to strengthen” an old Maine saying—and it’s usually true. It can go to zero in January at night, but rarely does so. The average daytime temperature in the shade is 32 degrees and the average night-time temperature is 14 degrees. By February, the days are longer, the sun is higher and the back of winter is breaking. We are the same latitude as southern France, and if you look at a globe, you’ll see that we are not as far North as five northern states. We are not as cold as Chicago or upstate New York for instance. We are in USDA plant zone 5 or 6A—the same as Missouri or Taos, New Mexico. There is no breakfast or housekeeping service provided during winter. 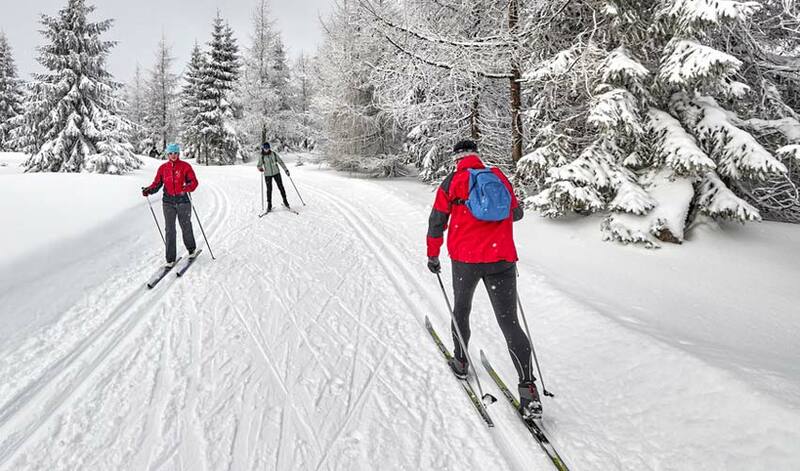 In the winter, you can cross country ski on the carriage roads in Acadia, or if there hasn’t been much snow, skate on the lakes. Winter bird watching along the Ocean Path is another popular activity. There is wonderful winter walking on the loop road (no cars in winter) or on the carriage roads—I advise having ice grippers for your boots as water runs across the roads and leaves icy coatings. Photography is a great winter activity. Acadia is open except the loop road is closed to cars. There are restaurants and shops open in Bar Harbor and on the island. The College of the Atlantic and theatre groups present play, speakers, etc. The library presents “Sunday Afternoons at the Library”—local performing individuals or groups play music for us. Mira Monte’s inn building is closed in the winter, but the Suite building is open—some have kitchens and double whirlpool bath/showers plus fireplaces. There is no food or maid service provided, but the units are reduced rate. We are available to help you plan your time. 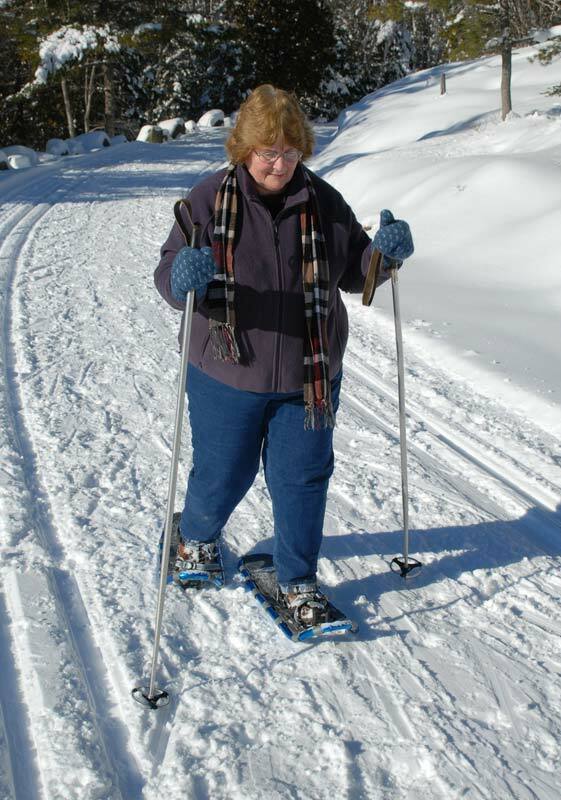 Snowshoeing in Bar Harbor—Acadia National Park: Snowshoeing is a great activity for people of any age. During good weather part of the park loop road remains open, allowing access to the ocean vistas of Sand beach, Thunder Hole and Otter cliffs, free of charge. 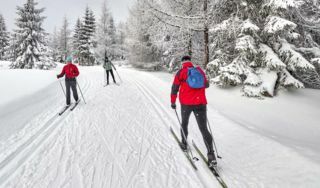 Cross Country skiing Bar Harbor—Acadia National Park: Cross Country skiing is a favorite winter activity. During good weather, part of the park loop road remains open, allowing access to the ocean vistas of Sand beach, Thunder Hole and Otter cliffs, free of charge. Snowmobile in Acadia National Park: Snowmobile travel is allowed on the 27-mile (43 km) Park Loop Road system (including the road up Cadillac Mountain) and most fire roads. Maps of the east side and west side show snowmobile routes and parking. Snowmobilers are encouraged to utilize the Hulls Cove Visitor Center parking lot to access the winter snowmobile routes. Snowmobile rental is not available on Mount Desert Island.